Games can help people engage with science outside of the traditional realm of research and academia. And using games in ecological research is on the rise, helping ecologists answer questions they’d never be able to in a laboratory experiment. This is particularly true when it comes to answering questions about evolution, such as: which traits help organisms maximise their chance of survival? Natural selection operates over incredibly long timescales as individuals pass on their genes from generation to generation. With a game, we can speed up selection and test how different processes influence survival in just a few clicks. 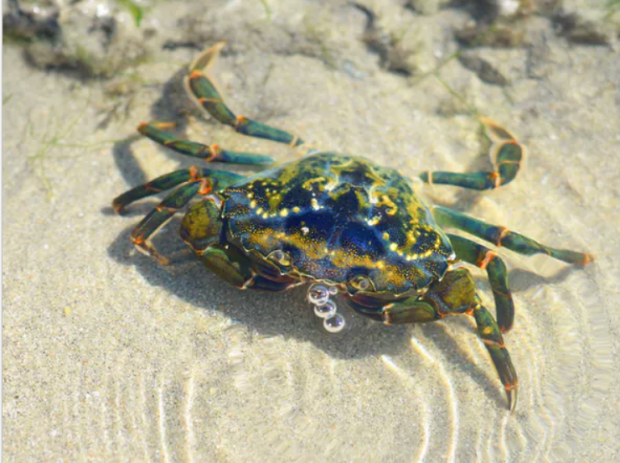 Our citizen science study enlisted ordinary people to help researchers find out which colours and patterns help crabs to camouflage. Digital games were deployed at the Natural History Museum, London, featuring images of common crabs defending themselves in different environments. Camouflage is one of the most common defences in nature, but many species change colour and pattern as they grow older. Shore crabs (Carcinus maenas) are no exception. Juvenile shore crabs are known for their bright and varied colouration, which helps them camouflage in a range of habitats. But, despite this diversity when young, they all become greener with age. Why this happens remained a mystery – until now. A team of Finnish and British ecologists combined forces with game developers and science communicators at a firm called FoAM Kernow. Together they created a touch-screen game in which museum visitors searched for camouflaged crabs. A series of crabs were displayed against photos of different coastal habitats, challenging players to find them as fast as possible. At the end of each round, players could see how fast they found them and which crabs hid most effectively, with the research results shared with participants in real time. Photos of crabs found in rockpools, mudflats and mussel beds were displayed against each environment on a sleek screen during the museum’s Colour and Vision exhibition. Visitors to the exhibition performed the role of predators in the crabs’ environment – each on a mission to find crabs hidden in the different habitats. With thousands of “predators” playing the game, the team were able to see which colours and patterns helped the crabs hide most effectively. The citizen science game enables us to explore crab survival – something that would be really difficult to measure in the wild. This helps us to better understand why the crabs change appearance as they age when reared in controlled conditions. The time taken to find each crab – and whether it was found at all – allowed the researchers to see how effective each crab’s camouflage was. Across all environments green crabs were the hardest to detect. They were the most likely to survive and took the longest to find, offering clues to why crabs get greener as they grow. While baby crabs can be camouflage specialists – fine-tuning their appearance to match their surroundings – as they grow it pays to get greener and avoid predators across a wider range of environments. This shift from specialist to generalist camouflage may explain why many other species also start to look more similar as they age. Unlike many citizen science activities, the game shared live results with participants as they played, generating what is quite possibly the fastest public engagement with a research finding.